While I'm talking politics... I saw this site on Urban Prankster today. 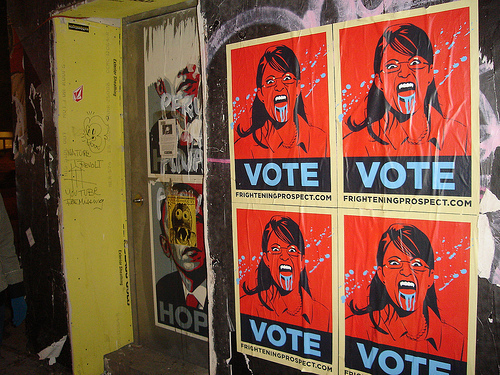 A Frightening Prospect is an interactive wheatpasting project, urging people to spread the word via poster that Sarah Palin is bad news. To better ensure that Americans with a devious/artistic/political streak have the proper tools the site not only supplies wheatpasting how-to's, but a high quality print out the poster. It's that easy. It's that awesome. Thus, we have a topic that has also called "awesome" 100% out of retirement.